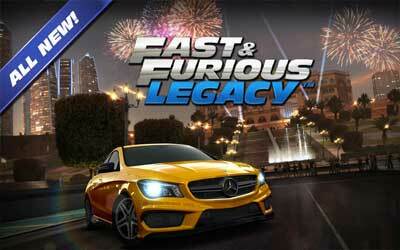 Fast & Furious: Legacy APK 3.0.2 becomes one of the raising games nowadays. This game is adopted by movie with the same name; The Fast & Furious. While playing this racing game, you will join with Roman, Letty, Tej and others to be the king of street as imaged in the Fast & Furious movies. You will be allowed to guide your crew strive against the rivals to be the best racer. The racing will be taken in around the world such as Rio de Janeiro, Tokyo, Miami, and Los Angeles. In short, you will be invited to feel the real sensation as in the movies. There are many features you can try in this racing game. First, you have the right to customize your car. This feature allows you to paint your car, add vinyl, unlock nitrous boost, and upgrade the engine of the car. It seems like you have your own racing car and you are a racer. Second, you are going to have your own solid crew. They will support your rave, chat with you, and record your race times. Third, you are allowed to join story mode. Story mode invites you to join with Letty, Roman, and Tej to take some missions. This game comes in high definition graphic 1080p which will give you as real as possible gaming experience. If you are going to install this game on your android, make sure that you use at least Android 4.0. More level of android will give you better gaming experience. You also have to prepare at least 514 megabyte of free space to store this application. It is such an amazing experience of becoming part of the adventure of this game. Install Fast & Furious: Legacy for Android now and tell your friends about your heart-pounding while playing this game.